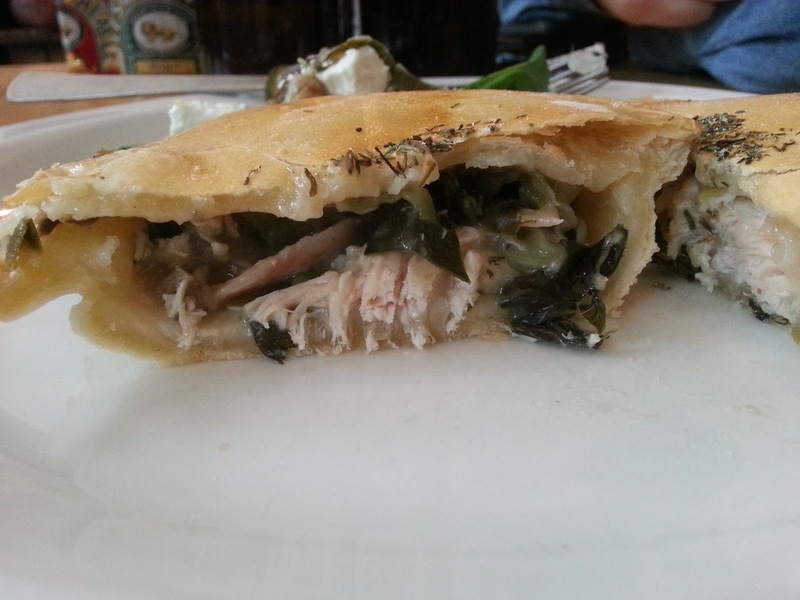 Pierate - Pie Reviews: Look Mum No Hands! Today's pie review comes from the Look Mum No Hands! bar - a bicycle-themed bar in Shoreditch, London. I was there for a charity quiz, and was doing wheely badly (perhaps I was two tyred) when a pie passed across the corner of my vision. I jammed the brakes on. "They do pies here!" I exclaimed to my team-mate Ben, who knows of my interest in the pastry-based items. And before I knew it, Ben had peddled off to the bar to order me one. Thanks Ben! As you can see, the pie is not the largest but it does look quite attractive and home-made, and pleasant to handle. 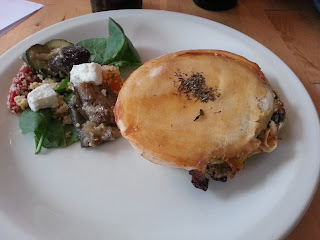 There is a dashing of herbs on the top, and the pie has a nice glazed pine appearance. However I would prefer the colour of the pie to be a little darker and richer. My adrenaline was pumping as I punctured my way through the pastry, but I spoke too soon. It was all downhill from there. Just look at the pitiful amount of filling. There were about 3 chunks of chicken in this pie. This pie is going to have a real mountain to climb if it is to recover from such a poor capacity rating. Already saddled with a low capacity score, does the pastry take the pie up a gear? Sort of. The pastry is very intriguing. It's neither shortcrust nor puff, and it's very light and delicate. The filling - what there is of it - does actually taste very nice. The pastry and pleasant tasting filling are good redeeming features here, but the poor capacity leaves this pie still stuck in a rut.